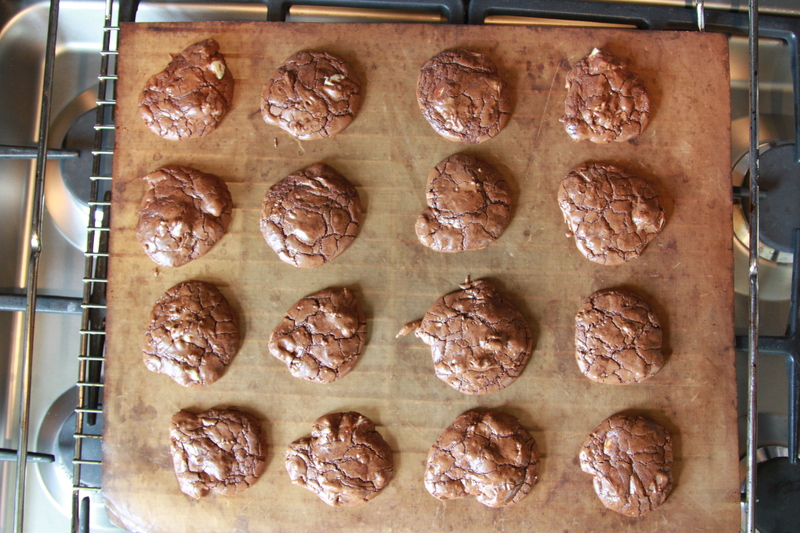 I felt that, as a parent, I needed to have a reliable recipe for chocolate cookies. Having tried a fair few I have decided that the (slightly modified) Hummingbird Bakery version is the answer. It’s a little bit more laborious to make than some others, but I promise the results are worth the effort. You can either make them quite large and get about 8-12, or make them small and get about 24 bitsize ones. You can also chill the mixture and then shape them into balls and freeze them for use later. You’ll have to freeze them on a tray until they are solid then put them in an airtight bag (like a Ziploc). 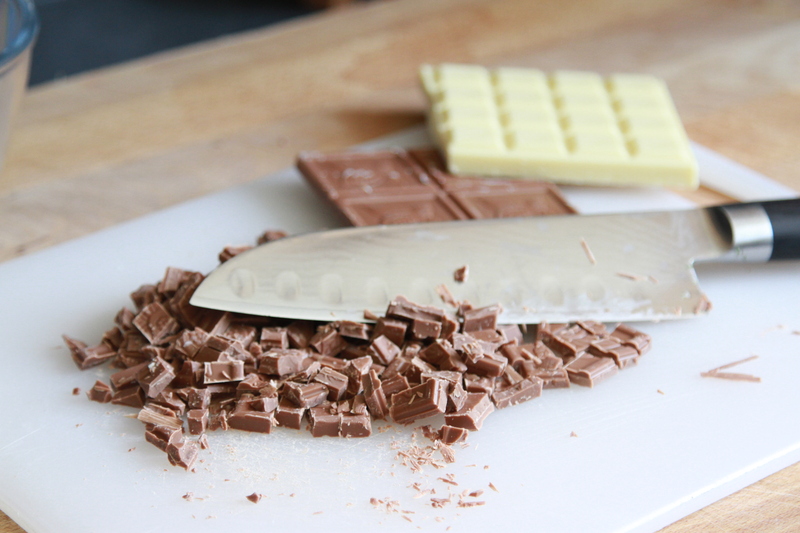 250g milk chocolate (or use dark or milk or any combination you like), chopped into small pieces. Pre-heat the oven to 150c (fan). Place the butter and the 250g of dark chocolate in a bowl and set it over a pan of gently heating water (a bain marie). Take care not to let the water boil or touch the base of the bowl as this can burn the chocolate and don’t let the water go into the chocolate as this can cause it to seize. Stir occasionally until it’s all melted and you have a glossy, thick, delicious looking, amazing smelling, molten goo. 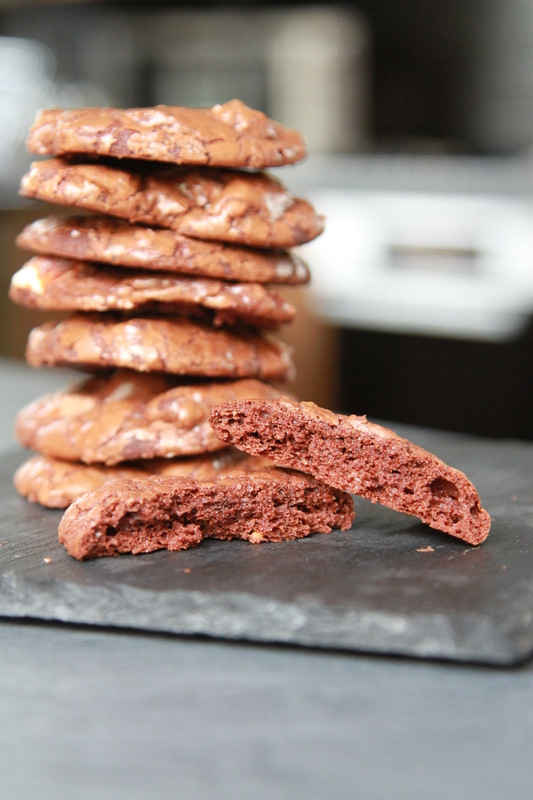 While the chocolate is melting, beat the sugar, vanilla and eggs. I put them in my Kitchen Aid freestanding mixer with the beater attachment. 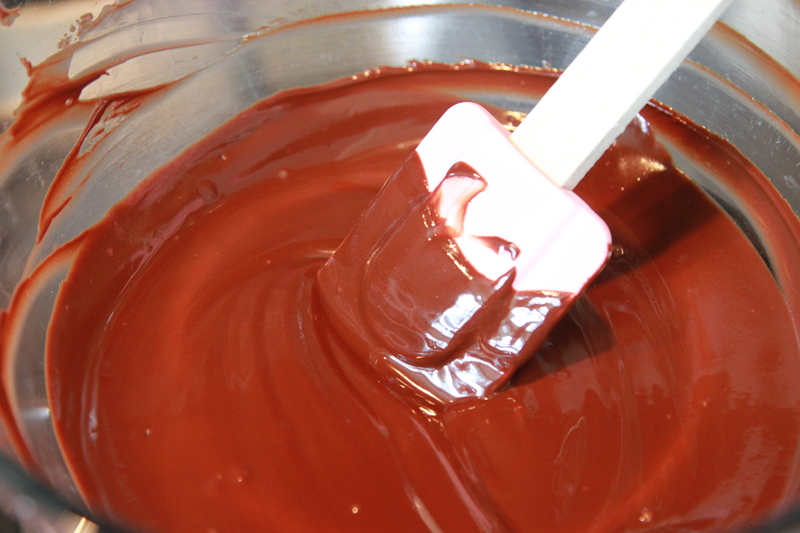 Slow the mixer down to a low-medium speed and pour in the melted chocolate and beat until it’s all well combined. In another bowl sieve the flour, salt and baking powder. Fold this into the chocolate mixture until all combined (you can do it in a couple of additions rather than all at once). 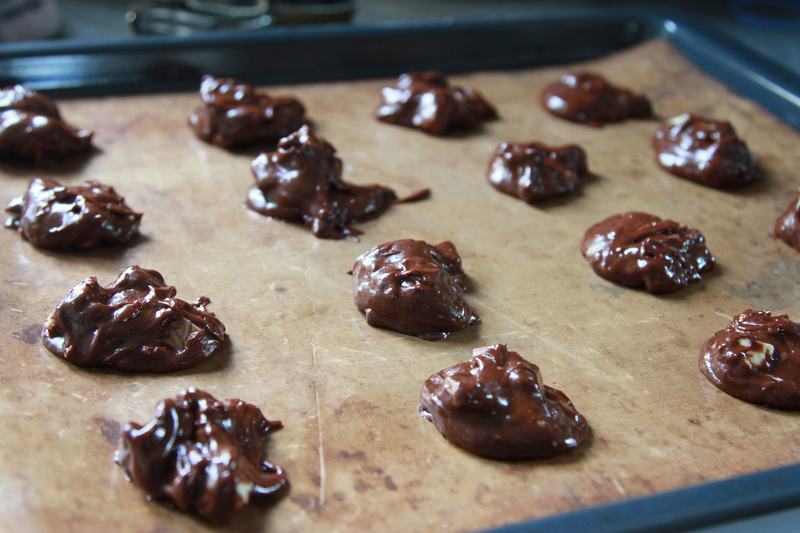 Lastly, add the remaining 250g of chopped chocolate and fold this in as well. 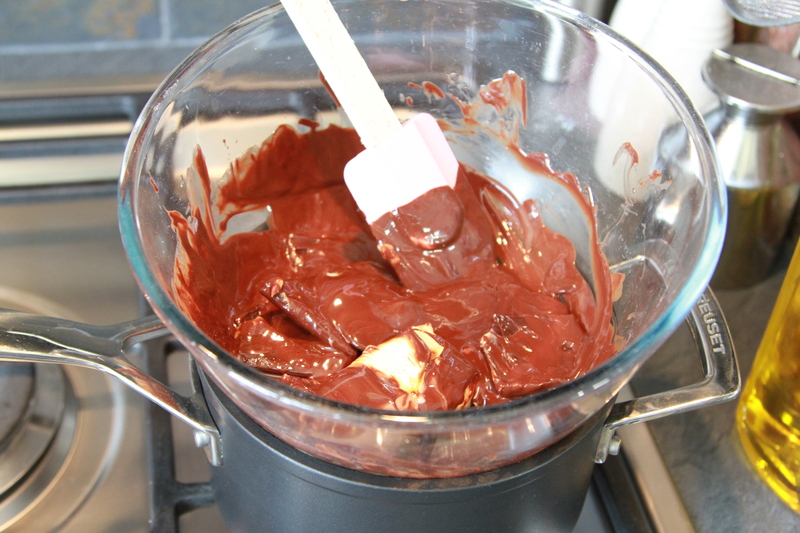 The mixture is pretty gloopy (more like a brownie mix) and is easier to deal with using a spoon rather than your hands. Spoon teaspoon fulls of the mixture onto a silicone bake sheet. Leave a bit of space between blobs as they will flatten out a bit as they cook. Bake for about 10-12 mins. Take them out when they have cracked slightly on the top and developed a bit of a shine. They should be quite soft everywhere but the edges when you take them out and allow them to cool a bit before trying to take them off the sheet or they will fall apart a bit!